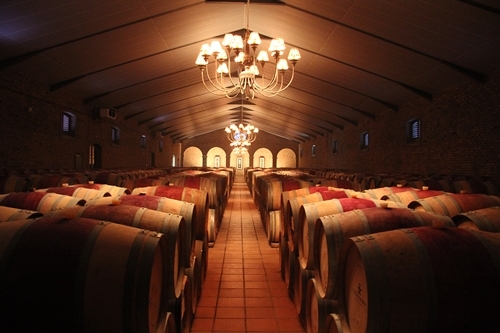 WINE-LIST.ME » the Waterford Estate is a real gem..
the Waterford Estate is a real gem..
Waterford Estate is positioned in the Blaauwklippen Valley in Stellenbosch, nestled between the two mountains Helderberg and Stellenboschberg. 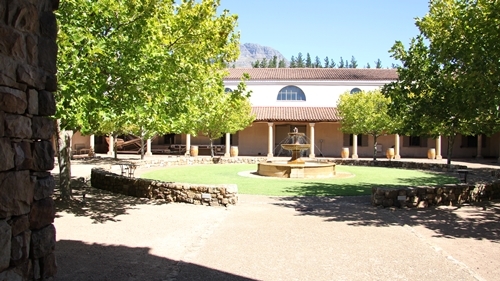 The Estate was established in 1998 by Jeremy Ord with the former Rust-en-Vrede winemaker Kevin Arnold. The handsome “Rhodesian Ridgeback” stands guard at the entrance to the alluring Estate. (RR is a dog breed developed in the Southern Africa). I sampled wines from all their ranges. 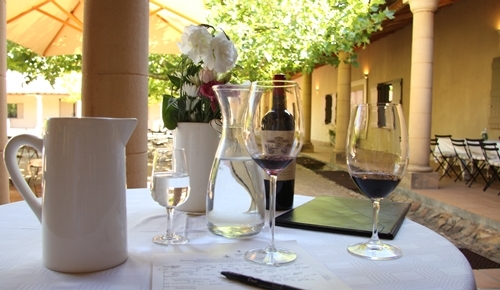 Very impressed by the qualities; even the Pecan Stream range present clean flavourful wines. Famous for especially the Cabernet Sauvignon. Their Shiraz and Sweet Wine are moreover very admirable. And their hedonistic Icon “The Jem” is an exquisite experience! So dense, rich and complex! “Kevin Arnold Shiraz” in the tall glass and “The Jem” in the short Riedel glass. 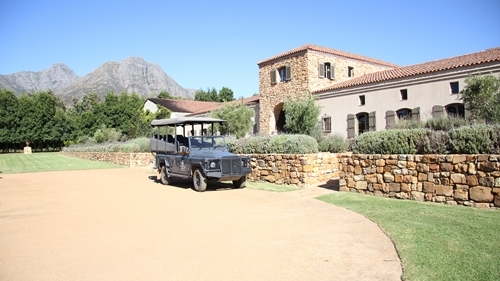 The Land Rover parked in front of the Estate is used for their 2 hour Wine Drive Safaris, where they take you around the property to experience the stunning slopes, vineyards, and natural habitation. 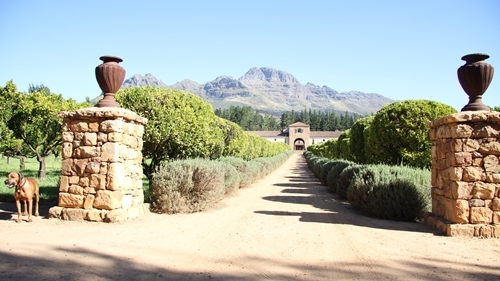 They have chosen to plant vines on only 50% of the 120 hectare property, and have left sections untouched to preserve the natural flora and fauna found in the picturesque valley. The Estate’s architecture is among the most romantic I have seen so far. It is designed by the architect Alex Walker and created from quarried local bedrock, stones from the vineyard and timber grown on the estate. The courtyard’s centre piece is the iconic fountain, that also feature on the Waterford labels. No expenses spared. Here their state of the art cuverie. 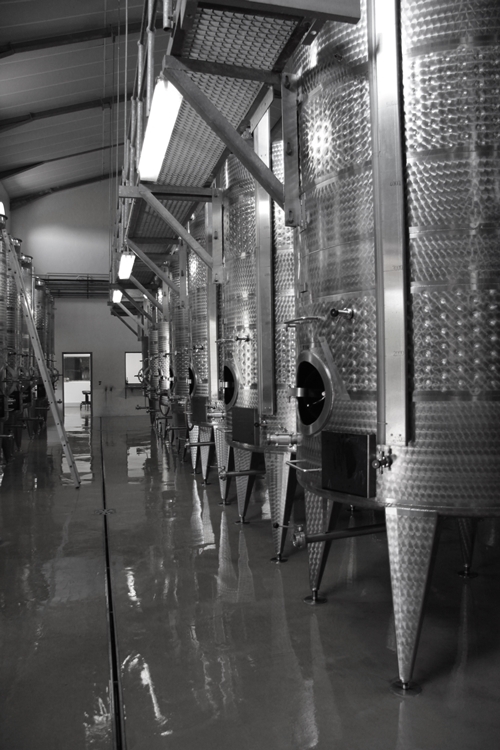 Their impressive steel fermentation tanks. 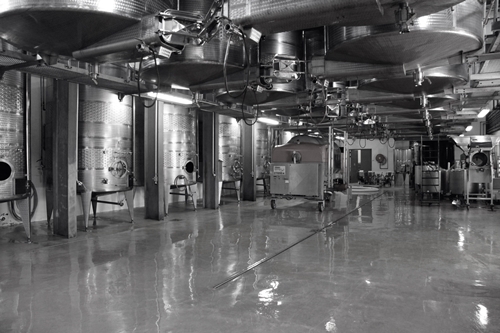 The workers are here captured bottling their Icon wine “The Gem”. 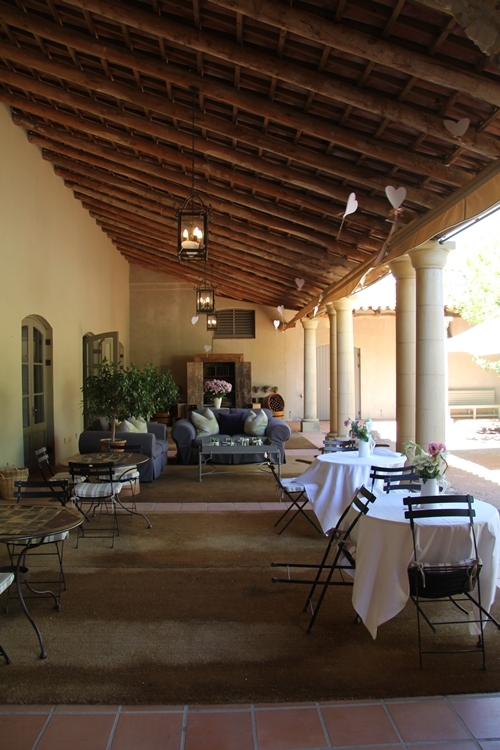 Their terrace, which faces the magical courtyard, makes the perfect setting for their tastings. 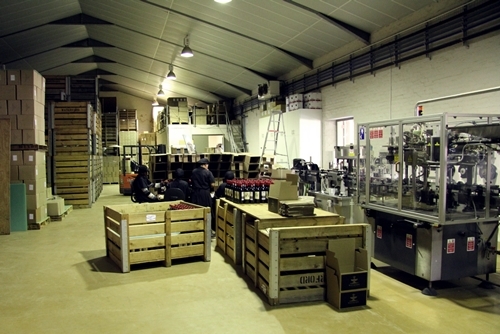 Waterford is for one known for the original Chocolate and Wine tasting. It is made in a collaboration between winemaker Kevin Arnold and chocolatier Richard von Geusau. They have together created a series of dark and milk chocolates, that emphasise the individual characteristics of the paired wines. A must try!